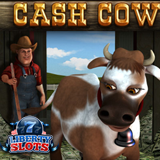 The new Cash Cow slot from WGS has only been online for a few weeks but it's already living up to its name! Rachel C from California won more than $22,000 in one of its many bonus features at Liberty Slots the other night. “With all its bonus features I had a feeling we’d be seeing lots of big pay outs on this new game!” said Mark Ramirez, casino manager at Liberty Slots. Rachel has been playing at Liberty Slots for a few years now. She enjoys old favorites like Amanda Panda and Agent Cash but she tries all the new games as they’ve come out as well. Last week she tried the new Cash Cow game that was released last month and got lucky shortly after entering the barnyard. She hit the Pick ‘Em bonus game which delivered an astonishing $22,500 pay-out. Player racked up massive win during one of the games many bonus features. • At the beginning of each spin a Cash Cow random prize of up to 12,500 coins is displayed. Spinning one Cash Cow symbol wins 1% of it, three wins 10% and four wins it all. • Ten free spins can be randomly awarded at any time. During free spins, three Bonus symbols trigger the Pick ‘Em bonus game where players pick up to four milk jugs to reveal instant prizes – up to 2000 coins. • Kooky Chicken symbols award an instant prize of up to 600 coins. “This windfall is going to come in really handy,” Rachel told a Liberty Slots customer service agent. “We've always talked about a trip to Hawaii and this may finally make that dream come true!" For a limited time, using coupon code CHICKENSPINS, you can claim a 200% bonus up to $200 plus 100 free spins on another extremely popular slot game from Wager Gaming, Funky Chicken.